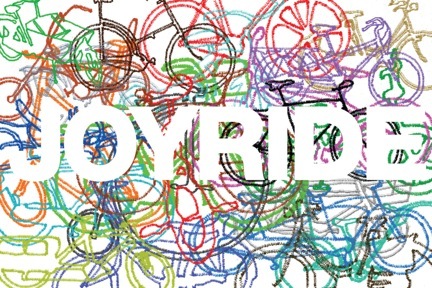 Bicycle Film Festival is pleased to announce “Joy Ride” (Los Angeles), a group exhibition in collaboration with Anonymous Gallery and New Image Art. Curated by Brendt Barbur, Joseph Ian Henrikson, and Tanya Arakawa Rosenstein, this exhibition brings together a select group of internationally established and emerging artists all who share a passion for the bicycle. Joy Ride is a visual manifestation of one of the most powerful and culturally relevant movements of this decade: the urban bike movement. Featured Artists: Kenny Scharf, Jonas Mekas, Martha Cooper, Agathe Snow, Kelsey Brookes, Cheryl Dunn, Maya Hayuk, Ryan Humphrey, Kenzo Minami, James Jean, , Scott Campbell, Erik Foss, Peter Sutherland, Mike Giant, Leo Fitzpatrick, Chiara Clemente, Julia Chiang, and MORE! Where: BFF Storefront Gallery – 4316 Melrose Ave. This entry was posted in Uncategorized and tagged anonymous gallery, Art, bicycle, joyride, new image gallery on August 26, 2009 by Sandra Burciaga Olinger.